Among the many updates and features released in TrakIT over the last month, a few useful ones are described below. As you're aware the Data field for a workflow could hold a list of items from which one could be selected. With the latest update, you can allow the Data field to hold multiple items. When defining a list, just specify the Multi-Select field with the maximum number of items that can be selected or select 'Unlimited' for no limit. Once this is done, you will be able to select multiple items for the Data field. Each item selected is displayed on a separate line. 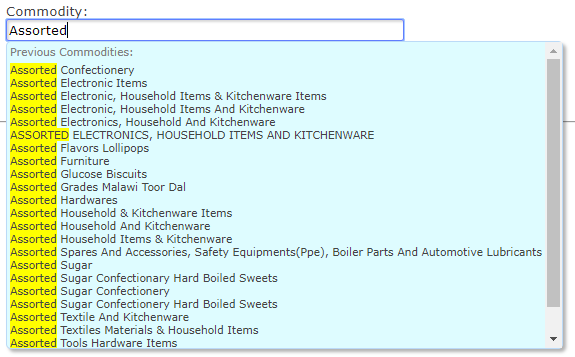 The selection of items is high-lighted on the drop-down list and clicking on the item in the list toggles the selection of the item. 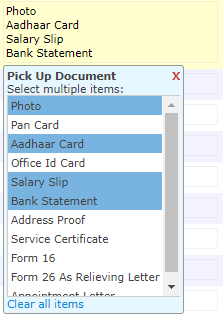 Shown below is an example where a user has selected 4 out of the many documents available on the list. Please note that manual entry is not possible in a multi-select list. If manual entry is required, set it as a single item list and select the option "Non-list Items Allowed" when defining the Data field in the workflow. With the number Events and Data fields growing, it became cumbersome to keep scrolling up to save changes made to events or data fields. This is now solved by a floating 'Save' button that pops up when the original Save button scrolls out of view. The floating Save button is only visible when on then Events or Data tab. The commodity field is a free-text field present in work orders. When making the same entries again is different work orders, it is easy to make spelling mistakes or write the commodity is a different way. With the new auto-complete feature, you can pick from the previously entered commodities to save time and maintain consistency in data. If a new commodity needs to be entered, simple ignore the list and enter the commodity as usual. Data fields can now be validated using Regular Expressions. A Regular Expression is a sequence of characters that defines a pattern against which the user input can be validated against. Regular Expressions can help validate user input against a variety of cases such as phone numbers, email addresses, special numbers, codes, numeric expressions, and many other cases. This can get a bit technical so TrakIT Support will assist you in setting up any validation expressions your require. A full explanation of Regular Expressions is beyond the scope of this blog. For guidance on what RegEx is, see Regular Expressions.There are hundreds of tutorials on the subject. Event / Data actions can now close or cancel work orders based on conditions and schedules. For more details on setting up Actions for Events and Data fields, see Automation With Event/Data Actions. In addition to sending, emails or messages, you can now choose the action to close or cancel the work order. There are many other changes, features, fixes that we keep developing and releasing. If you have a cool feature that you'd like TrakIT to have, please don't hesitate to contact us and we'll do our best to implement it. And as always, please contact TrakIT Support for any assistance required. With the latest update of TrakIT, it is possible to now customize columns based on header fields, events and data fields. This is applicable on the main operations, finance and invoice pages. This customization can be done by the TrakIT support and can include custom fields as well as computed fields on the headers. Specific fields can also be chosen to be sort keys if applicable. Customization can also be done for individual users as per their preferences. For customizing the columns in your installation of TrakIT, please contact TrakIT Support.